We pride ourselves on being the kind of club that can help and encourage you to get the most out of your running - whether your interest is running for fun, getting fit, or training for anything from a 5K race to a marathon or even an ultra. We can help you achieve your aims. Anyone is welcome to come along to our training sessions and run, regardless of age or ability - we have groups for everyone so you don't have to run alone and you won't get left behind. We organise evening runs and weekend runs - both on and off road - and training sessions. Come along on a Wednesday night and see for yourself! Almost Athletes has been running since 1988, welcoming runners of all abilities and providing not only guided training runs but also a lively social calendar. 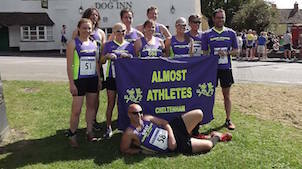 With a current membership in excess of 400, Almost Athletes really is Cheltenham's biggest and friendliest running club! The weather was relatively mild for this year's Dursley Dozen, but the lack of sun meant that ground conditions were hard with some very slippery sections, particularly on the downhill sections for the 13 Almost Athletes who took part. The last cross country race of the season saw wintry weather for competitors. In addition to a strong turnout for the men, Becky Stephens was the sole lady representative from the club and ran well in spite of the challenging conditions finishing in 57th place.